Summer is here. Time for all the sizzling barbeques! While BBQs aren’t the typical summer get-together for your friends and families, it is a great setting for any corporate function. Fun and sporty, this ambience is a great match for any rejuvenating, relaxing or great teambuilding function. Any BBQ setting encourages fun communications among co-workers. It is a great experience to have your food while interacting with customers outdoor, enjoying a delicious brunch at a beautiful venue. This is an experience which is sure to get people talking. Are you looking to have a memorable BBQ experience with your work friends? 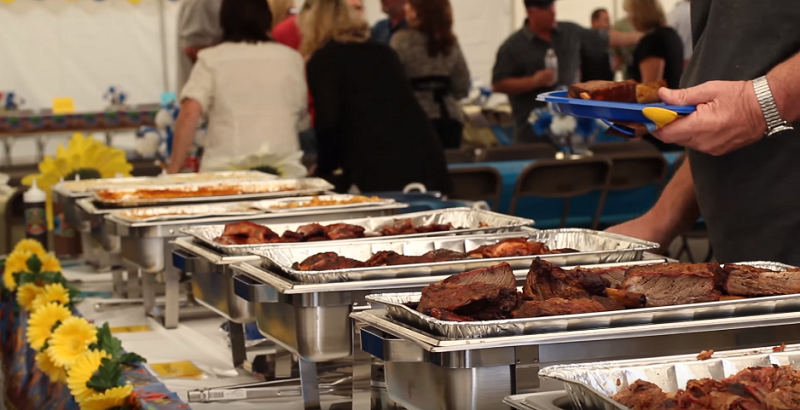 Well, then here are 9 tips to keep unpleasant happenings away and yet have an unforgettable BBQ catering menu. Grills must always be kept outside or at least away from exterior walls. If you are using a gas drill, make sure all points are secure and tight. In case you smell gas while cooking, immediately step away from the drill and call for help. When on a charcoal drill, do not add in kerosene, gasoline or any other additional lighter fluid once you have had the fire started. Keep the grills clean. They must also be free of all sorts of residue. Cleanse a 3-feet area around wild campfires. Keep water at hand if you ever need to put out fire. Do not leave a grill unattended. Also keep pets and children, as far away from flame as possible. Make use of long-handled cooking utensils in order to keep your body as far away from the heat source as possible. Be sure you keep your food cold, till it is time to cook the meat. Use a meat thermometer while cooking to keep optimum cooking temperature for your meat. In case you sustain a burn, remove all accessories and clothing from the burn site, thereby run cold water on this injury to cool the skin and then opt for medical attention. No summer can ever be complete without friends from work, without time spent enjoying a good conversation, warm breeze along with mouth-watering grub cooked on an open grill. Not only does grilling keep the energy costs of your home down, it further lets you spend outdoor time amidst fresh air while allowing your food to gain a unique flavor. All of this can only be achieved by a proper BBQ set-up. Have fun!